Trump Dubai's par-3 17th has made an impression on several early visitors. DUBAI—In these contentious times, we finally found one thing that can be agreed upon by Muslims and Christians, Democrats and Republicans, Phil fans and Tiger fans: Trump International Golf Club Dubai is one helluva course. The grand opening of the club is still two weeks away, but a nonpartisan visit on Wednesday revealed a course that traverses highly imaginative (man-made) terrain, boasting a thrilling variety of risk-reward holes, interesting greens and gloriously firm turf that promotes the ground game and accentuates the many challenging runoffs around the putting surfaces. There is nary a waterfall, Roman statuary or other hokum that blights lesser properties in the Trump golf empire. No, the President has created something that is – dare we say it? —understated. Of course, most of the credit goes to course architect Gil Hanse. 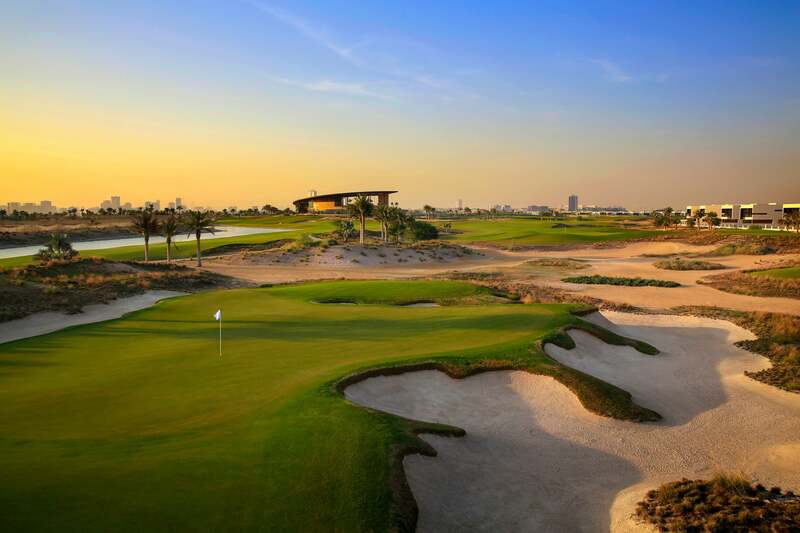 Rather than the flat, boring target golf that is typical of Middle Eastern courses, Trump Dubai evokes the style and substance Hanse's Olympic Course in Rio. Both tracks were built on featureless sites, bringing to mind the old Robert Trent Jones maxim, "Minimum land requires maximum architecture." Trump Dubai announces its intentions on the 1st hole, a stout par 4 that shares a massive double fairway with No. 9. "I know this is blasphemy," says Hanse, laughing, "but the inspiration was the first hole of the Old Course. People haven't seen anything of that scale and size in the Middle East." This, ultimately, is the President's greatest influence in shaping the course. He made only one short site visit during the construction and had minimal input on the design, but behind the scenes he was an effective advocate for Hanse's vision. Trump Dubai is the heart of a sprawling development created by the Dubai-based builders Damac Properties (Eyebrows have been raised and headlines have been made by the President's cozy relationship with Damac's founder, billionaire Hussain Sajwani). It is the company's first golf course project; the second will feature another Trump-branded course designed by Tiger Woods, slated to open in 2018. "The people at Damac don't really get golf," says Hanse. "They just wanted 18 holes to build around, and they didn't care what it looked like. The Trump team pushed hard for us to have wider corridors to play through, and ultimately Donald got it done. That was hugely important to what I hope is the success of the course." Trump Dubai is a 20-minute drive from the city center and its iconic sky-scrapers. Much of the course is ringed by squat, square, cookie-cutter houses, but Hanse has come to appreciate their presence. "Out there the desert goes on forever and ever," he says. "I despise the word framing when it comes to golf holes, but in a nice way the housing helps to frame the landscape. I know that's counter-intuitive to us minimalists." The fourth hole at Trump Dubai is a rousing par-4 with a bunker on the inside of the dogleg. The safe line to the left leaves a long approach to a well-protected green. The bolder play is a forced carry right of the bunker, over a waste area. This begins the most interesting series of holes on the course, which are set among towering glass apartment buildings that create a surprisingly cool amphitheater effect. On the 5th through 8th holes Hanse moved the most earth, in places going 20 feet deep into the sabkha, the packed-sand flats below ground level. Before construction began he drove into the desert outside of Dubai to draw inspiration on how to shape the land. Says Hanse,"I looked really hard at the way the wind sculpted the dunes and how they rippled and moved and connected to each other." His artistry has been appreciated by the most well-traveled of audiences: the many pros who have played Trump Dubai during the European tour's current Middle East swing. "When you start moving that much dirt most people usually overdo it or underdo it," says 2010 U.S. Open champion Graeme McDowell. "It's very hard to create that nice rolling feel and effect, but I thought Gil did a great job of producing something that looks authentic." The back nine of Trump Dubai is a par-35 and plays more than 300 yards shorter than the front. (From the tips the course measures 7,229 yards, with a rating of 73.9 and slope of 131.) But the back nine features the most talked-about holes on the course. "I loved No. 12," says young English pro Tyrrell Hatton, who holds the unofficial course record with a 67. From the back tees this bunkerless par-4 measures only 287 yards but it has a tiny green protected all around by fiendish runoff areas; Hanse calls it an ode to Riviera's famous 10th hole. The collars at Trump Dubai are Tif-391 Bermuda grass and they transition nicely into Tif Grand Bermuda fairways. All of it is more closely cropped than Tiger Woods's goatee. "Some of the finest turf I've ever seen," says Hatton. "Just immaculate. The tight lies really test your short game and I love the way the ball runs out." Hatton calls the par-3 17th his favorite hole on the course, and it is probably destined to be the most photographed, with a lovely green surrounded by sand. The par-4 finishing hole is reminiscent of Sawgrass's 18th, with water running down the entirety of the left side and the green perched on the precipice of trouble. Looming over the hole is what is instantly one of the coolest clubhouses in golf, a sweeping, modern design that mirrors the vibrancy of Dubai's architecture. "It's an impressive place," says McDowell. "The Don—, I mean, the President doesn't do anything halfway, does he?" No, his excesses are legion. But regardless of how visitors feel about Trump and his politics, expect the approval rating for his new course to hover near 100%.